The first time I went to Europe, to live then travel, I brought two pieces of luggage -- a huge suitcase and a backpack I had borrowed from a friend. Unbeknownst to me at the time, I probably needed about 1/2 of what I brought, even though I would be over there for several months. But...travel & learn. When it came time to actually travel, I left the big suitcase and went with the pack -- a nice and humongous Eagle Creek pack with a day pack attachment. The pack was made for someone at least 5'7", and again, was chock-full of my worldly possessions. 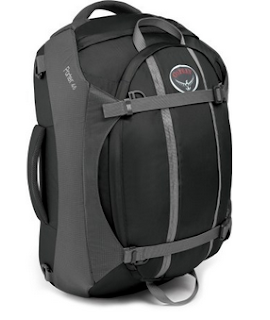 Flash forward 15 years -- many more trips, many roller suitcases, many cobbled streets, back injuries, tired arms from lugging said roller suitcases up staircases, and education about how backpacks should fit -- and finally I decided it was time to invest in a pack of my own. I did a fair amount of research and knew what I wanted -- a pack small enough for me (5'4"), small enough to fit as a carryon, and large enough to fit all I'll need for at least a two week trip. A few months before I left for Colombia, I headed over to REI to see if they could suit me up. And voila, suit me up they did. I was presented with the Osprey Porter 46, an awesome, compact pack that fit the bill. I promptly started to use the pack for all my weekend trips, and was amazed just how much could fit into the pack. It seemed to hold almost as much as my "carry-on" roller suitcase (I'll admit, it is rather large for a carry-on). I could even just stuff a bunch of stuff in there sloppily, and then use the straps to squeeze it all in. When it came time to pack for Colombia, I was easily able to get everything in there with extra space. Even as I jammed more in there, I could very easily fit it in every overhead bin I tried. While it didn't happen this trip, if I did need to check it, the straps can be hidden so as to comply with the regulations. The only fault I can find with the bag is that the waist strap doesn't hold as tight as I would like, so that puts a little added pressure on my shoulders. This is fine for shorter jaunts, but does get tiring after a while. Overall, though, I am super pleased. I only wish I had invested in something like this a long time ago!